Oregon City's Isabelle Lewis went 3 for 3 with two doubles and two RBIs, and Phoebe Borkus added an RBI-single and a two-run double to help pace the Pioneers to a 12-5 victory Monday over Crater to open the North Clackamas/Rex Putnam spring break softball tournament at Hood View Park in Happy Valley. After Crater struck for four runs on three hits and three walks in the first inning, Oregon City answered in the bottom half of the inning with four runs on three hits and two Comets' errors. The Pioneers took a 5-4 lead in the second inning when Jordan Duntley drew a one-out walk, went to second on Emilia Coffman's sacrifice bunt, and scored on Lewis' infield single to the left side. Oregon City broke the game open in the fifth when the Pioneers sent 11 batters to the plate and scored seven runs on five hits, two Crater errors, and a sacrifice fly. Borkus had one of the key blows with a double to center that scored Emily Dugan and Hannah Stewart and pushed the lead to 8-4. Aliyah Kelly pitched the final five innings in relief of Oregon City starter Preslie Ritz and held the Comets to one run on three hits with three walks and two strikeouts. OREGON CITY 7, PENDLETON 4: Isabelle Lewis drew a bases-loaded walk to push home the go-ahead run in the fourth inning, and Phoebe Borkus and Hannah Vickery added RBI-singles in a two-run fifth that helped seal the Pioneers win over the defending-Class 5A state champion Buckaroos at Hood View Park. Oregon City starter Tennisyn Parrish pitched a complete game, allowing four runs on 12 hits with three walks and one strikeout. OREGON CITY 3, CENTENNIAL 1: Emilia Coffman went 2 for 3 with two doubles and Jordan Duntley added two hits and two RBIs, pacing the Pioneers to a win over the Eagles in another North Clackamas/Rex Putnam tournament game at Hood View Park. Aliyah Kelly drew the start for Oregon City (3-5) and pitched a complete game, holding Centennial (4-4) to one run on seven hits with one walk and one strikeout. SUNSET 5, CLACKAMAS 1: Sunset's Abby Wingo went 2 for 3 with a double, three RBIs, and two runs scored to help lead the Apollos over the Cavaliers in the Savanna Showcase tournament at Whittier High School in Whittier, Calif.
Alyssa Daniell had two of Clackamas' four hits off Sunset pitcher Grace Kimball, who walked one and struck out 10 in six innings for the Apollos. WHITTIER (CA.) 4, CLACKAMAS 1: Whittier's Bernadette Quintero hit a two-run home run and Nicole Velarde added a solo homer, leading the Cardinals to a win over the Cavaliers at Whittier High School. Clackamas pushed home a run in the fourth inning when Ellie Martin drew a two-out walk, advanced to second on a passed ball, and scored on Kylie Hegar's single to left. CENTRAL CATHOLIC 1, PUTNAM 0: Central Catholic's Kimberly Pulido blanked the Kingsmen on four hits — all singles — with four walks and seven strikeouts in the North Clackamas/Rex Putnam tournament at Hood View Park. Logan Kelly scored from third base on Zoey Bredlau's one-out infield single to the left side off Putnam starter Melia Croydon, who held the Rams to one run on seven hits with four walks and 13 strikeouts. NEWBERG 17, MILWAUKIE 7: Brooke Poff went 3 for 4 with two RBIs and three runs scored, and Allie McCartney added two hits with a two-run triple to lead the Tigers over the Mustangs in North Clackamas/Rex Putnam tournament action at Hood View Park. Milwaukie's Jaden South hit a three-run homer in the second inning for one of the Mustangs' five hits in the game. 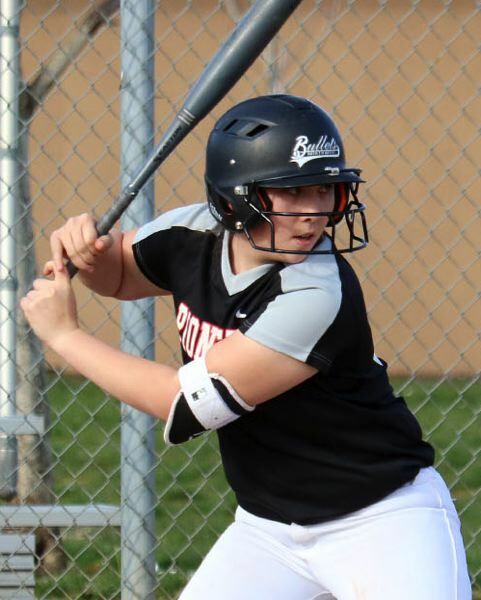 GLADSTONE 13-20, SPRINGFIELD 7-1: Savannah Tunon went 3 for 3 with two doubles, three RBIs, and three runs scored, pacing the Gladiators to a 13-7 win over the Millers in the opening game of a doubleheader at Gladstone High School. Gladstone starter Aubrey Jayne pitched five innings, allowing one run on three hits with one walk and six strikeouts. In the second game, Dessie Alvarado went 3 for 3 with three RBIs and three runs scored, and Carmen Collins added a two-run homer in a 10-run third inning to help lift the Gladiators to a 20-1 blowout win.